Green tea sampler: What's your best choice? Tea is becoming very popular these days and that means more people are searching for new tastes. One of the best introductions to a wider range of flavors are samplers. A green tea sampler is also a great low cost gift choice in its original gift box, or to include in a homemade gift basket. Everyone has a different palate, so not all selections in each sampler may become your favorites. Remember, you can give some away to people in your group of tea-sharing friends. The following selections have reviews available to help you choose the ones you think you will like the best. Please note: all contents are subject to change by the manufacturer at any time, so always read the product description before purchase. Here's a green tea sampler offering larger amounts, and using organically grown teas. 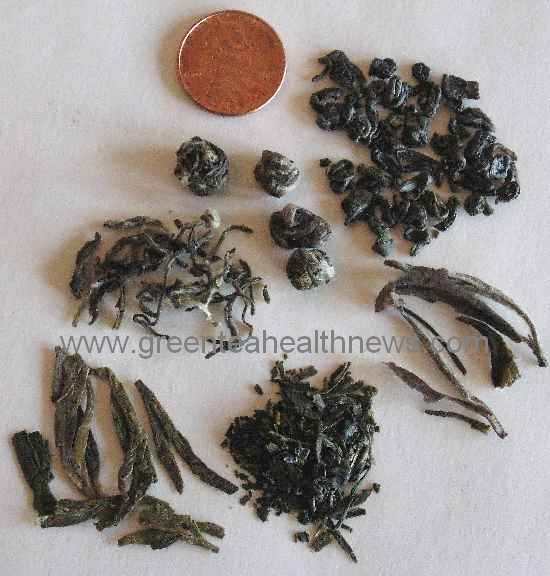 It includes organic Dragonwell, organic Gunpowder green, organic Chun Mee, and organic Sencha. One of the most famous teas in the world, this Chinese tea was originally named for its location, growing near a water well named for a lucky dragon. The leaves are processed to retain a flat shape and many will float vertically when steeped in a cup. It has a desirable complex flavor. Also called Long Jing and other variants, it is said that more of this tea is sold than is actually grown. Also known as zucha or pearl tea, these Camellia sinensis leaves are rolled tightly into small balls to help preserve the nutritive and aromatic chemicals during longer transport. They were knicknamed "gunpowder" by the British. It has a stronger flavor frequently preferred by former coffee drinkers. Also called "precious eyebrows" because of the tiny leaves and curved shapes resembling the painted eyebrows on a porcelain doll, this selection has a milder flavor suitable for a daily tea. Because of its curled leaves, it was named for the resemblance to tiny green spiral shelled snails by a Chinese emperor. Slightly nutty flavor. This is a green tea named for the white tips of the leaves which give it a delicate sweetness. It is grown in the Taimu mountain area of Fujian province. These leaves are carefully scented with fresh jasmine flowers, creating a lovely romantic aroma, and suitable for evening use. Grown at higher elevations in Fujian province, this tea tastes more delicately fruity than herbaceous. This tea is highly prized for its complex flavor and deep sweetness. Extra care is taken to shade the leaves for several weeks before harvest to increase the unique amino acid in Camellia sinensis called theanine. This is the everyday tea of Japan. While highly standardized, there are artisan variations named for their growing district or for the time of harvest. A moderate quality tea that has additional roasting for a more nutty flavor. With this tea, the leaves are mixed with popped brown rice. Some have added small amounts of powdered leaves for coloring. This mild variation uses stems of the Camellia sinensis plant for a mild nutty flavor. Because it excludes the leaves, the beneficial catechins are substantially reduced.